Posted January 19, 2018 by Riley Hooper & filed under Arts & Entertainment, Movies. History has shown that making a successful trilogy is easier said than done, but in the case of the Maze Runner series, director Wes Ball has produced the goods. The third and final instalment of Maze Runner, The Death Cure stars Dylan O’Brien, Thomas Brodie-Sangster, Rosa Salazar, Aiden Gillen, Patricia Clarkson and many more. The film continues to follow Thomas (O’Brien) and his friends as they attempt to break through the wall to save the immunes and take down WCKD. 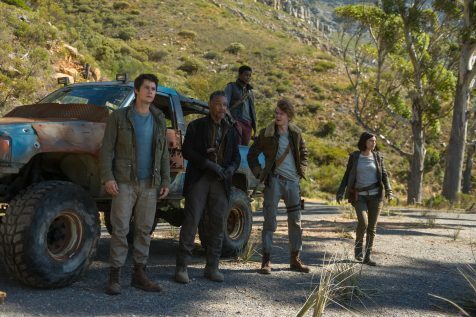 Rallying up with cranks the group is granted permission past the wall and by using Teresa are able to break into WCKD for their final fight. An absolutely awesome film filled with action, comedy, explosions galore, emotional deaths and suspense with the cinematography and performances from O’Brien and Kaya Scodelario the standout. The movie had the audience in the cinema applauding and should be on everyone’s watch list this summer.